Gálvez had received detailed descriptions of the state of the defenses in 1779, when he sent an aide there ostensibly to discuss the return of escaped slaves, although Campbell had made numerous changes since then. Pensacola's defensive works in early 1781 consisted of Fort George, an earthen works topped by a palisade that was rebuilt under Campbell's directions in 1780. North of the fort he had built the Prince of Wales Redoubt, and to its northwest was the Queen's Redoubt, also built in 1780. Campbell erected a battery called Fort Barrancas Colorada near the mouth of the bay. Gálvez embarked his flag with the Spanish fleet, under the command of Captain José Calvo de Irazabal. With about 1,300 men, the regular troops included a Majorcan regiment and Arturo O'Neill (later Governor of Spanish West and East Florida) commanding 319 men of Spain's Irish Hibernia Regiment, and including militias of biracial and free Afro-Cubans. Gálvez had also ordered additional troops from New Orleans and Mobile to assist. A second attack by the Choctaws began on April 19, interrupting the siege preparations, and that day a large fleet was sighted heading towards the bay. Although at first thought to be bringing British reinforcements, the ships turned out to be the combined Spanish and French fleet from Havana commanded by José Solano y Bote and François Aymar, the Baron de Monteil, having on board Spanish Field Marshal Juan Manuel de Cagigal. Reports of a British squadron sighted near Cape San Antonio had reached Havana, and reinforcements had been sent to Gálvez. 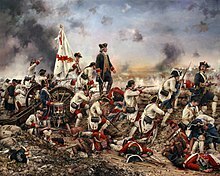 The Spanish ships carried a total of 1,700 sailors and 1,600 soldiers, bringing the total Spanish force at Pensacola to an unstoppable 8,000 men. Solano decided to remain to assist Gálvez after the disembarkation of the troops, and the two men worked closely together. The terms of capitulation included the entirety of British West Florida, the British garrison, large quantities of war material and supplies, and one British sloop of war. Gálvez had the batteries and Fort Barrancas Coloradas moved nearer to the bay's entrance, and placed a battery on Santa Rosa Island against British attempts to recapture Pensacola.